Snubbing James McClean is by no means Trap’s first unpopular decision as a manager. Trapattoni has a history of making controversial decisions. IN CASE YOU haven’t heard, Trapattoni made the less-than-popular decision to leave James McClean out of the latest Ireland squad today. Juventus may have won the Serie A title in the 1981/82 season, but their success was not enough to dissuade the Italian manager from selling Brady in order to accommodate new signing Michele Platini. This decision was relatively controversial at the time, particularly after Brady scored the penalty that won them the Championship, despite knowing he was to be sold. However, the decision ultimately proved successful, as Platini went on to enjoy a hugely distinguished career with the Turin club. In 1998, during his time as manager of Bayern Munich, an embattled Trapattoni had a near-meltdown at a press conference in which he turned on his team, suggesting that “these players were weak like an empty bottle”. Meanwhile, one Bayern Munich player, in particular, seemed to provoke his ire: ”Strunz! Strunz is two years here and has played ten games. 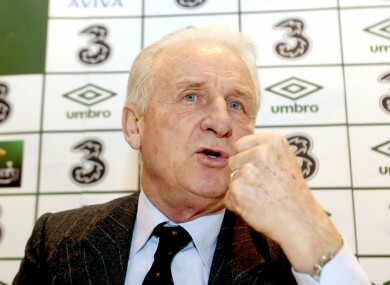 He is always injured.” Unsurprisingly, Trapattoni left the club shortly thereafter. You can view the video of the infamous game here. After taking over as coach of Benfica in 2004, Trap had a relatively successful first season in charge at the club. Though they ultimately were defeated in the final of the Portuguese Cup, he still managed to guide them to the league title. However, he subsequently surprised everyone by announcing his decision to step down from the position, claiming he was homesick and wanted to live closer to his family in Italy. Email “Deja vu: here are 5 other controversial decisions that Trap's made in his career”. Feedback on “Deja vu: here are 5 other controversial decisions that Trap's made in his career”.